These classes are designed to give your employees the confidence to respond to the victim of a medical emergency. Your employees will be shown what to do as a “First Person Responder” to help stabilize the victim, while waiting for the advanced help to arrive on the scene. The following classes are taught at your location. This class will teach your employees to provide CPR to a victim who is NOT breathing and may have no pulse. This class includes the lecture data from the RMO class as well as a film on CPR techniques and personalized mannequin practice. Certificates of completion will be issued upon successfully passing a practical mannequin test and a written test. Duration: 4 Hours / Attendance: up to 20 persons max. This class is designed to cover the contents and usage of the MIC First Responder/First Aid Kit. Various contents of this kit are used in almost every rescue which may take place at your business. The kit contains a CPR micro-shield, two pair of vinyl gloves plus items for eye injuries, severe cuts and bleeding, swelling, burns and more. The components are color coded for easy recognition and unitized for individual use. These “modules” may be added to the basic RMO/CPR classes already provided by MIC to you as a client or may be taught as separate sessions. 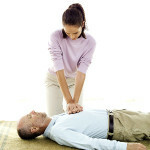 The RMO or the CPR class may be a prerequisite to a separate stand alone session. Your employee will be certified in the use of your AED in compliance with the Good Samaritan laws of many states. Your employees will learn the importance of your AED. The principle of early defibrillation and the chain of survival. They will also get an understanding of the automated analysis of cardiac rhythms plus training in the use of the AED in Sudden Cardiac Arrest (SCA) emergencies. They will have “hands on” practice in eight possible scenarios. CPR is a prerequisite and attendance is limited to 6 employees. This class complies with applicable OSHA regulations including 29 CRF 1910.1200. Your employees will learn what makes a chemical hazardous, how to read various types of hazardous labels, how to read a Materials Safety Data Sheet (MSDS). Your employees will also learn safe work practices. Our programs are based on the same scientific guidelines and treatment recommendations used by the American Heart Association®, Inc., and the American Red Cross for course development and are substantially equivalent to their commercially available products. MED-ALERT also monitors state laws and regulations relating to emergency medical training. This helps us ensure that MED-ALERT training classes and Instructors comply with all the training requirements and policies associated with providing emergency medical training in a particular state, for a particular industry, and to a particular audience. I can not tell how helpful, respectful and proactive this team is. They went above an beyond our expectations! Med-Alert has Spanish instructors who can teach your employees our classes in Spanish ** Tell our class coordinator if you need Spanish instruction!